Sales enablement mobile apps are changing the way the sales people interact with potential customers. The apps are designed to equip sales professionals with testimonials and marketing tools which will make it easier to convert sales with potential prospects. These mobile apps are designed to work with all types of platforms. These types of apps can help sales people to establish trust and also educate their customers. When customers feel that you're an expert or authority in the field, they are more apt to purchase products and services from your company. The primary goal of any sales enablement mobile app or customer engagement software is to optimize every interaction with every customer. Some companies use mobile apps for sales engagement to present audio and video clips to customers. This is a great tool for routine sales meetings, and the best part is that most of these commands can be executed without the Internet. This is great because it's not an impediment if the connection is not working when you're trying to sell to your client. This is often the case with in healthcare facilities where the connections are limited. Choosing a company that is at the forefront of sales enablement mobile apps is essential to the success of your company. Prospects have numerous questions, and your sales people need tools at the tip of their fingers to be able to convince customers to buy. Select a company with a product that's easy to navigate and has numerous options that will appeal to customers. Customer references and testimonials are a great inclusion in these types of apps. Some of the biggest names in the industry supply these mobile apps and can help sales people sell their products. Because prospects don't want to feel pressured and sold, these products are available to help sales people educate the customers and convince them to buy through education. If sales prospects are educated, they are more likely to buy than if they are pressured and sold. It's helpful to let customers know how products can benefit their lives. 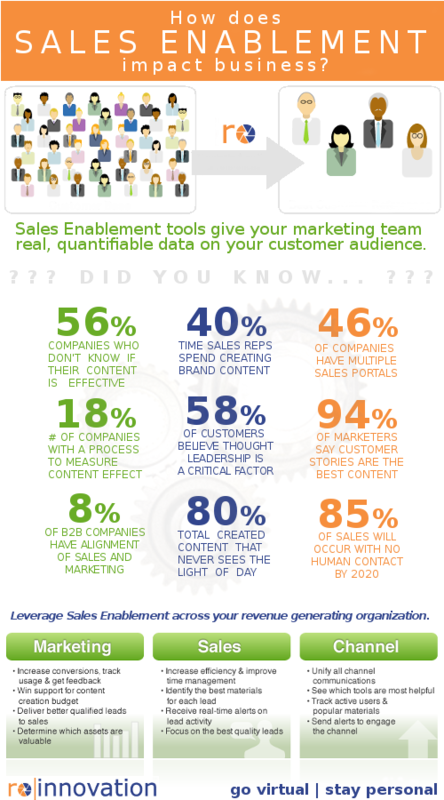 Sales enablement apps can help to streamline the sales process. Marketing activities in addition to the app can yield a higher return on investment. Trade shows and conferences are some of the best ways. Sales people need to maximize their time with clients and close sales as quickly as possible. When you influence without selling, you'll be pleased with outcome. More than likely, you'll convert more sales and increase the profitability of your company. Try customer reference software and sales enablement apps to determine what it can do for you. Debbie McMurtry is a technology consultant based in Denver, Colorado. She specializes in innovative software solutions for business. Infographic courtesy of ROInnovation;.